Ribose belongs to a class of chemicals called "monosaccharides," simple sugars, similar to the natural sugar found in fruit. The sugar makes up a component of the B-class vitamin riboflavin, commonly known as vitamin B2. Like all B-family vitamins, riboflavin aids in the metabolism and digestion of carbohydrates, lipids and proteins obtained from your diet. The Linus Pauling Institute at Oregon State University recommends that adults ingest between 1.0 and 1.6 milligrams riboflavin each day, and eating foods rich in ribose can help you reach this intake level. A group of food high in riboflavin, and therefore also high in in ribose sugar, are dairy products such as milk and cheese. The Linus Pauling Institute explains that 1 oounce of cheddar cheese -- a piece about the size as a domino -- contains 0.11 milligrams riboflavin, while 1 cup, or an 8-ounce. 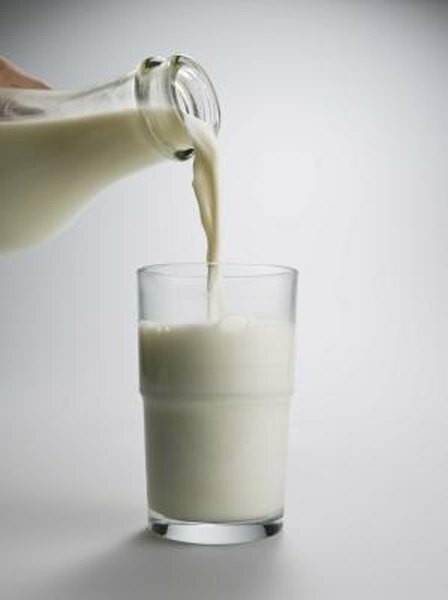 serving of milk contains 0.34 milligrams, both contributing significantly to the 1.5 to 2.0 milligrams per day recommended intake. Cheese and milk are also sources of complete protein, providing the building blocks your cells use to make your own proteins, as well as essential vitamins and minerals like calcium. Incorporate these foods into your diet to help boost your ribose intake. Some types of vegetables also contain ribose and riboflavin. A serving of asparagus, broccoli and spinach contains 0.13, 0.10 and 0.21 milligrams riboflavin, respectively. In addition to their ribose content, asparagus, broccoli and spinach also contain dietary fiber -- indigestible plant fibers that help maintain the health of your digestive tract, prevent some forms of cancer and help you feel full, according to the Harvard School of Public Heath. Eat several servings of vegetables, including ribose-containing veggies, every day as part of a balanced diet. Whole grains and fortified cereals also provide a source of riboflavin and ribose, according to the University of Maryland Medical Center. Many flours and cereals are fortified with added riboflavin, so products containing these ingredients also contain high levels of the vitamin. Whole-grain products also have a number of other benefits, in addition to their ribose content. Whole grains contain nutrients that are lost during food processing, and the nutrients in whole grains can help reduce your risk of type 2 diabetes and cardiovascular disease, reports the Linus Pauling Institute. Eat at least three servings of whole grain foods each day to consume a healthy source of ribose. Harvard School of Public Health: Fiber, Start Roughing It! What Vegetables Are Considered Carbs?